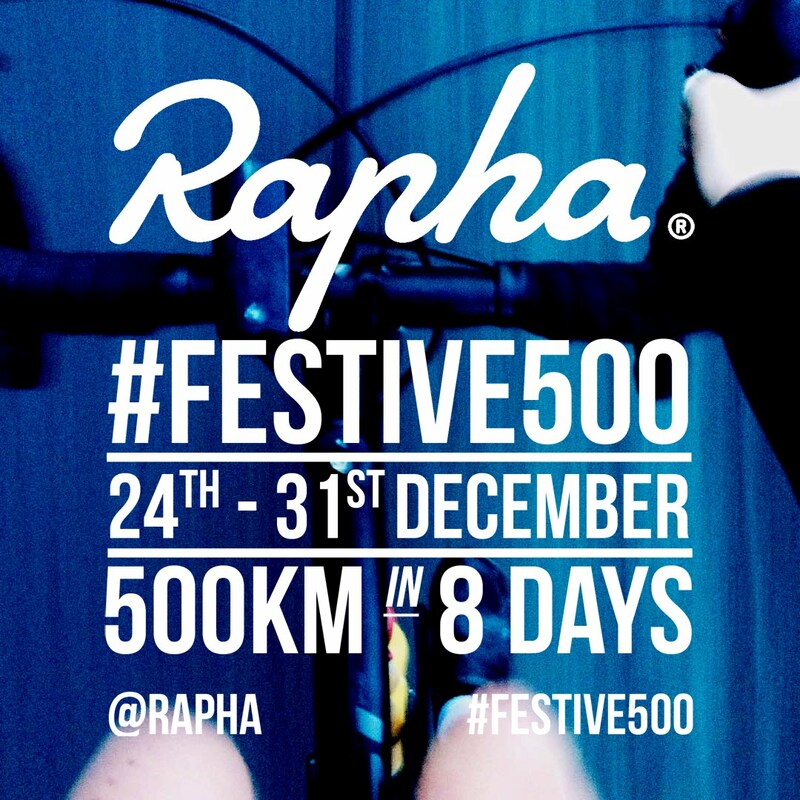 My first race around the streets of London, the first completely flat run in a while, a first race with friends and the first of many events for 2015. 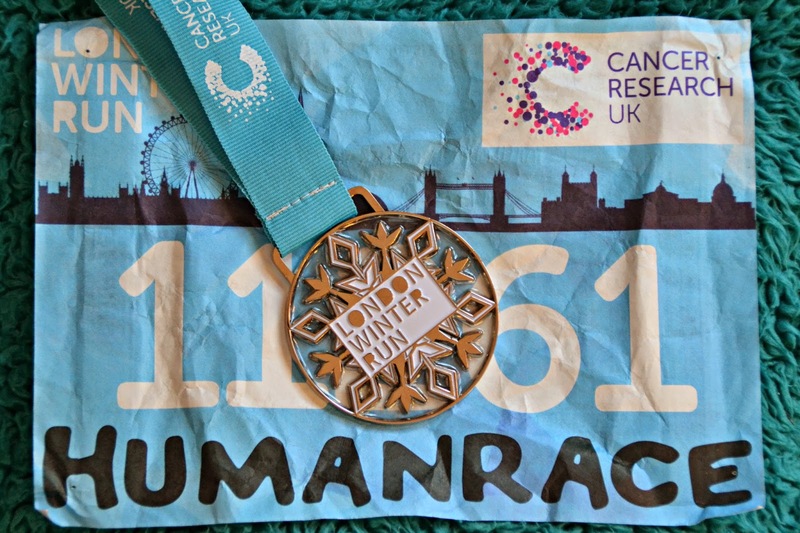 This was the Cancer Research Winter Run 10k and I rather enjoyed it. The Winter 10k for me was a number of things; a chance to run with friends, run round the streets of London and also to just run. I booked this race way back now as I wanted to race around the time of my 21st birthday and it just so happened that this race fell the day before, and I also knew quite a few people running. It was Leah's last race in London, before the marathon in April, and I thought it'd be a lovely chance to meet up with friends, meet new people and to finally meet Leah in person. Going into this race I was and wasn't looking for a PB. I knew I could achieve one, as I felt fitter than last May when I raced We Own The Night, but my main aim was to have fun and enjoy running in a city I love. I managed a PB by just over 10 minutes and I was over the moon at the time I achieved. Although I run a lot, I haven't actually ran that many races so seeing seeing my times improve is very motivating for me. In terms of the event itself. I thought that it was very well organised. From the moment I exited the station there were people directing you to the event. There were lots of volunteers about making finding the start line or the bag drop very easy. Of the majority of people I spoke to I think I was one of the only ones to actually use the bag drop and I was very impressed by how smoothly it all went. I simply chose one of the many lanes, each one had at least 5/6 people manning the desks, handed over my bag (you had to use the one supplied in the race pack) where it was given a number and I was given a matching wristband. Once that was done I walked through the tent and out the other side. Each lane allowed two people to drop of bags at a time and the one way system kept it flowing incredibly well. The only issue I think people may have found with this is that you could only use the bag supplied in your pack, at the drop. At first I was worried it wasn't going to be big enough but I found I could easily fit a change of clothes, hoody, my coat and scarf all inside. I was meant to be in start wave 3 but actually ended up in the second wave, and very nearly in the first! There was no checking of bibs, that I experienced, so if you wanted to I think you could have probably arrived a bit earlier and made your way to the start line to start in an earlier wave. After a warm up lead by Fitness first, repeated for each wave, it was time to go! 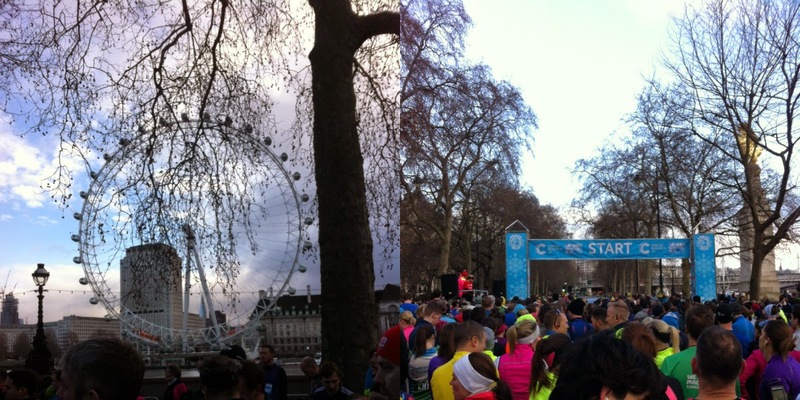 The start line was sat right opposite the London Eye, a pretty iconic feature of the London skyline! The route made it's way up past Somerset House heading towards the Tower Of London. Heading back to the finish, the path wound it's way around various streets leading past St Pauls Cathedral. The first kilometer flew by with the second marking the Swiss themed tunnel. Running out the other end the distances moved quickly and it wasn't long before I found myself at 8k and knowing there wasn't much left. With 1k to go I quickened my pace a bit and suddenly the distance seemed to disappear. As I was running the last 800m or so I actually run past Charlie, Zoe, Leah, Ashley and a couple of others who were just starting their run as they had decided on a later wave. I turned a corner and there was the finish line just in front of me! I crossed the line and looked down and stopped my watch. A new PB and a very happy face. After picking up my medal, I stretched out, was spotted by Charlie and introduced to Harry for the first time. After also meeting Steph they started on their way to Bill's whilst I headed back to the bag drop to pick up my things and change into something a bit warmer. In terms of the race itself I did really enjoy it. I thought it was going to be a bit more scenic and maybe a teensy bit more snow in the zones, but I was just so happy to be running through the streets of London! Everyone met at Bill's after for Leah's brunch and it's where I got to meet a lot of new people who've I've only really spoken to before on Twitter. It was so lovely to get a chance to meet everyone and have lots of chats with some incredibly lovely people! The value for money? I booked my place in a group of five which meant there was a slight discount when you all booked together. The price was around the same that I paid for entry to the half marathons I've run at around £30/£35. At first I thought that the price seemed slightly high for a 10k event but as Leah said, the majority of that cost probably would have been for closing off the streets (something which I didn't initially think about). I'm really happy that I did this race and it's definitely helped to keep boosting my love for running. The medal has now proudly joined my two half marathon medals (Eden Project and Plymouth) as well as my band, and necklace, from We Own The Night. I enjoyed this race and it was a great event to kick off my events of 2015 and also running for a great cause. A big thank you to all those involved in making the race possible and every single volunteer that spent their Sunday making sure the event ran smoothly. Did you run the Winter 10k this year and if so what were your thoughts? And is this a race you'd be interested in entering in the future? Let me know @afloralcrown. Well done for doing the 10k! I really want to do more runs this year, they seem like so much fun!